This guy was keeping a close eye on me as I was getting my mail today from the box under his left foot. 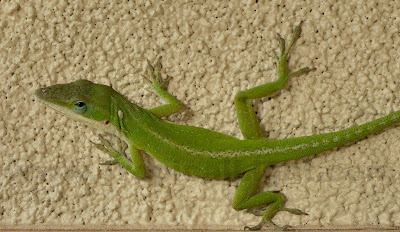 Although they are sometimes called the American Chameleon, they are not chameleons, but are instead a form of Iguana properly called the Green Anole. He scooted off when I tried to get a close-up. Thats a great pic! He is a beautiful color!